No that’s not a typo. 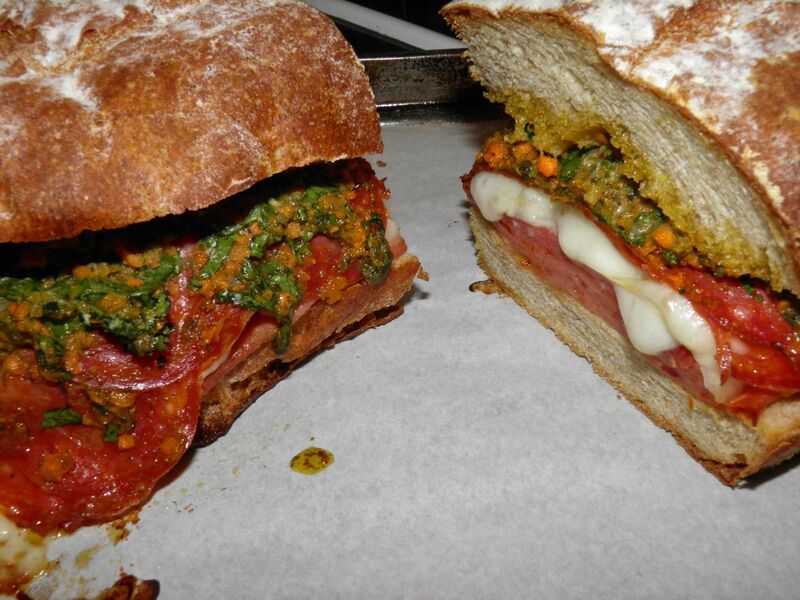 It’s panino, not “piano” that is music to the summer cook’s ears. Why? Because you can feed a whole family without turning on the oven – after the bread is baked of course. So what do you need for a family sized sandwich? A big loaf of bread. That’s where this post comes in. 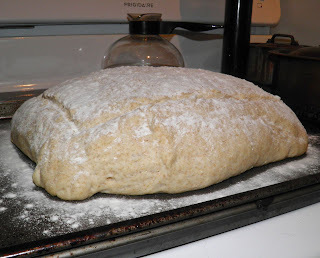 The recipe I am posting makes a loaf about 14” x 12” which is enough to easily feed 8 with a side dish or two. I hate to admit it but I did knead this loaf for all of 5 minutes. My usual bread recipes don’t call for any kneading. It’s done by autolysis, overnight. I don’t proof the yeast either. Of course make sure you are using fresh yeast – not from a jar that’s been in your cupboard for a year. I keep mine in the freezer. The reason I did knead is because to maintain a shape without a baking dish you need to have a little less water content than usual. It makes a stiffer dough. 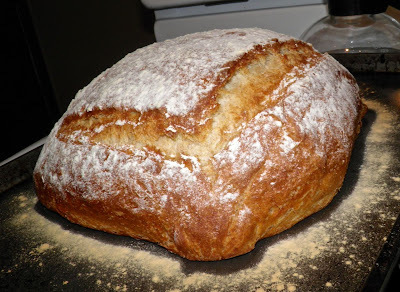 My ratio for most bread is twice as much flour as water. I went a little scant on this one. If you use a 2:1 ratio the bread may “blob” out while rising and not retain a rectangular shape. That shape is important for making even sized sandwiches. This type of sandwich is great for those hot summer days when you dare not turn the oven on in the kitchen. We’ve had a few in the past week and more will be coming. To make the actual sandwich I layered spicy mortadella, salami with prosciutto, and calabrese. For the cheese I used sharp provolone. There’s one ‘secret ingredient” to finish these sandwiches. It’s actually not a spread but more of a pickled condiment. There is an Italian classic, but I opted to venture out on my own after reading up on a few. It’s pretty good. 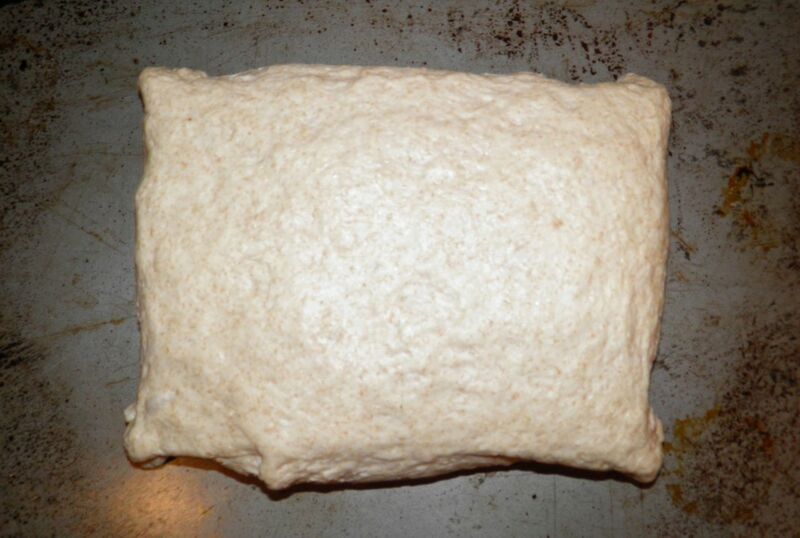 The dough in the morning. This is a great make-ahead recipe for a weekend fête or for any time you are having a group. I do have to admit this isn’t a cheap sandwich. Each of the meats, pre-packaged, range between $4-$5. So that’s $20 right off the top. But it does feed 8, so the per sandwich cost is bearable. It just hurts a little bit when you go through the checkout. I did do one semi-unusual thing with this loaf. 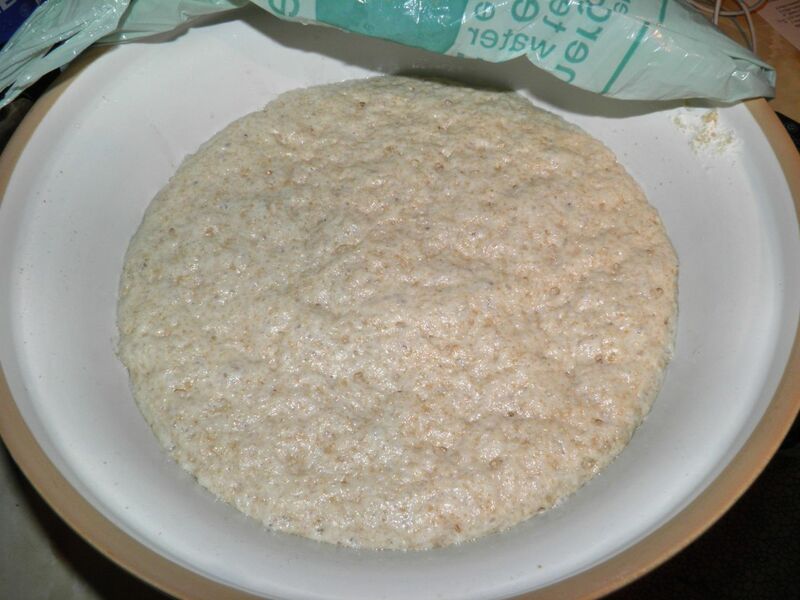 For a little extra nutrition I substituted one cup of the flour for a whole wheat. I had red fife on hand – a heritage Canadian grain. You can use all white flour if you wish. Next time you’re having a gathering and don’t want to spend your time in the kicthen, or if it’s just too darned hot to turn on the oven, think panino. It can bring a song to your cooking-weary heart. You have to pull the corners out to keep a rectangle shape. Mix all the ingredients together in a bowl. There is no need to proof the yeast. Transfer to the counter and knead for 5 minutes. It will be “wet” but not sticky. Place a little oil in the mixing bowl. 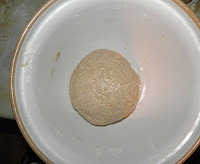 Plop the dough back in and swirl to cover all sides. Cover the bowl with plastic wrap and then a towel. Let rise overnight (about 8 hours). In the morning, punch the dough down and knead for about 1 minute. 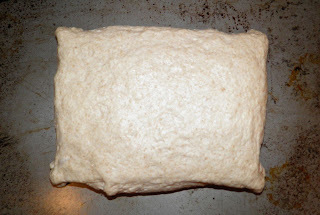 Roll like a log and then shape into a flat rectangle about 10” x 8”. Pull the corners out to points with your fingers to maintain the shape while proofing again. Let rise again until doubled, about 1 hour. While it is rising, preheat the oven to 400°F with a pan of water on the bottom rack. Just before baking, make 4 slits in the top in the shape of a rectangle. This helps prevent the bread from rising into a mound. Dust the top with flour. Bake for 25-30 minutes, removing the water pan at the 10 minute mark. The loaf is done when the loaf sounds hollow when tapped on the top. Proofed, slit and ready for the oven. Place all in a food processor or small blender and pulse until chopped small, but not a paste. Slice the loaf horizontally. Hollow out the top and bottom pieces. If not there will be too much bread in the sandwich. The excess bread can be saved for a stuffing, bread pudding, etc. Layer the meats, then the cheese, and finally the spread. Press the sandwich together, put a weight like a cast iron frying pan on top, and let sit for about 30 minutes. It can be heated in the oven to melt the cheese and crust the bread if you wish. Cut and serve.